The handicap group this year has been ripe for raider this year over the inner and Researcher was able to drop into town and score two back. While Researcher has a shot today I favor another horse on top for today's race. Manteca has a great chance to validate his credentials and win the Stymie at a price. Manteca has been impressive winning races from off and on the pace. The biggest question with Manteca is class, as he is stepping up in class. Most cappers' will dismiss him on the step up from statebreds to open stakes but we will look closer at his form. When a horse like Manteca can win from on and off the pace that is a sign of class. ordinary horses can only do one thing, Manteca can do it all. His form shows wins at various distances showing different run styles each time. Like Machiavelli said to be truly great sometimes you have to be a fox and sometimes you have to be a lion, Manteca has the class to be what he needs to be to win the race. Today he will be a lion from off the pace and validate his class. The price should be juicy on Manteca, we are still catching him on the upside. Watch the stretch run of his last race, as soon as Maragh gives Manteca his cue he reacts confidently and quickens, it was a real racehorse move. His paper form has several factors that will ensure a generous price. His last race has slow fractions that will turn off the public, his speed figure was slow and the DRF closer look dismisses him as a non-contender. We should see somewhere between 7-1 to 10-1. Manteca is a great bet. Win bet on Manteca and a exacta box with Researcher. 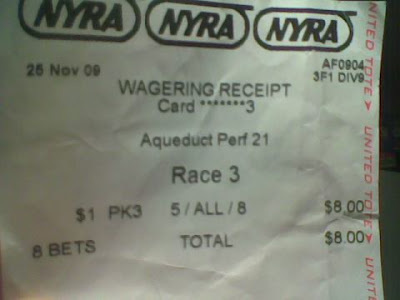 Who can forget Numaany's maiden breaker over the Aqueduct main track 2007? He runs in today's 8th race and has a shot. Weathered is a highly likely winner in this race. The form break from Weathered to the second choice Point Me To It is a huge chasm of equine ability. The third choice Rap Tale was overhauled by Are We Dreaming with complete ease. Are We Dreaming barely got by Weathered after she was softened up on 12DEC. Weathered has these girls right where she wants them aft of her caboose. Weathered should relax out there on the lead as she gets tremendous pace relief after two sultry pace heats. The last race on the 09JAn featured 3 stakes winning need the lead sprinters and the pace may have been the hottest pace in a route race for the whole entire inner meet. The race before she chased another need the lead filly. Today Weathered gets relief on the front end and the distance means that rating tactics will be be employed. Weathered will be able to relax out there and cruise. Low profile connections will hopefully deliver a bearable price. This years Aqueduct condition book is an ever changing beast. Back in the reign of former racing secretary Mike Lakow days you had your stakes, open allowance, claimers, NY breds, Maiden Specials and maiden claimer. While these race conditions were traditional they did not reflect the horse population and the needs to fill racecards. At the very end of Lakow's tenure there were so many short fields of open allowance races with a 1-2 favorite or New York bred allowances filled to the gills. If an owners horse did not fit these conditions that horse was shipping to Philly park for class relief or spending the year with one up the track finish after another. The current racing secretary PJ Campo has been creative and resourceful. Campo has been given a bushel of lemons and has crafted lemonade. Not only did he stop writing races that did not fill but he has introduced many new conditions; non winners of a race in six months or non winners of 4 life time or non winners of three life time or four year old. While there may not be the same amount of classy short field races, the field size and the competitive nature of the racing has improved. Campo's primary tool to fill races for winners is a non-winner of three lifetime or 4 year old beaten claimer race. Another popular condition is the non-winner of a race in the last six months condition. It seems like these new conditions are have been very popular at the draw and are carded as full fields. Campo writes them for tag from $7.5K all the way up to $35K. 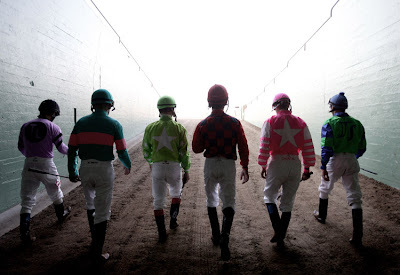 For the horseplayer they are very interesting puzzles, with so many class droppers, multiple winners in for the four year old condition or class risers. A horseplayer with a little bit of knowledge can get an edge and stay ahead of the masses as these new conditions are introduced. These new conditions are for the benefit of the whole racing community. These new conditions have increased the value of the young horses on the grounds. This helps out everyone for the owners all the way down to the grooms. If an owners takes on a two year old he can be confident that there will be many places to run for at least the first two years in New York. I see the claiming box has been lively with many active barns claiming horses. There are many places to run and this creates excitement and competition. Horses have been shipping in and trainers like Scott Lake have returned with a barn full of claimers. Another positive trend is that races have not been written as much for the strait New York bred allowances. This is a good thing. Variety has been introduced into the New York bred program. Comparatively the purses for the New York bred allowance were a gross overpayment for the quality of the horses running in the races. Many horses ran in these races because there wasn't anywhere else to run. Campo's fix for inequity and lack of conditions is the strait New York bred claimer. First Campo introduced the New York bred maiden claimer and now he has added a strait claimer for New York Breds. Why should horses run up the track for a $44K purse when their skill set is more reflective of a $20K purse? Campo is providing the conditions that reflect the horse population. Not only were horsemen limited in there options but horseplayers were bored. These New York bred allowances were mundane non-competitive races. When the greatest profits lie in having your horse to run second and third time after time so the horse could keep the New York bred condition it makes for a poor product. If your New York bred was non-competitive in the New York bred allowances there was no where to drop in class. Once your horse graduated from the New york bred N2X allowance the step up to open allowance or open claimers was too much. s. Now NYRA has those conditions so horse owners can pay the bills and the horseplayers have intricate puzzles to pick apart. With so many new conditions the racing's competitive nature has improved. With all of these changes, the Aqueduct Inner program has become one of the best winter meets in the country. Combine the varied racing conditions, full fields and the new wagering menu and this is a potentially profitable meet to follow. Surely quality on the top end is not up to par with the sunbelt meets but what it lacks in quality it makes up for in depth. Surely the choice of NYRA has the New York racing operator has been validated as the right choice. Aqueduct Inner along with Tampa may be the most improved winter racing products of this decade. If Valentine's put you in the hole, Power Cap is here with hope. If you are like me you have flower, chocolate and dinner bills. This is no time to sulk as we have a plan to have all of these paid off by the time they run the feature in Ozone Park. All these bills make me say Arrr! Which is ironic because the favorite in this claimer is Arrr who seems to get bet because of his silly name time after time. Judging by Arrr's 2 for 23 record and his lack of form he will be up the track at a short price. This is a good betting race. These beaten claimer races are usually loaded with 4 your olds with many wins but this one is unique. All of the horses except for a pair of them are in for the non-winner of three lifetime condition. The horses in for the four year old condition have an edge. Of the two that are in for the four year old condition Merlin Circle is the bigger morning line price and may just have a special trick up his sleeve. Merlin is making a huge drop in class, adds blinkers and has a bullet work on Friday the thirteenth. 20-1 morning line could pay off all the bills and turn presidents day into a literal pocket presidential showcase, everyone from Washington to almost President Benny will be in on display if Merlin can do the trick. In addition to the Merlin win bet toss in a double using 5,6,7,8 / 7. If you want more action box 5,6,7,8 in the exacta for 12 roses. Understatements race on New Years day made a huge statement. On New Years we turned the page on the calender and said hello to a mega closer bias. Except for Understatements race, all of the two turn races were won by deep closers and several short priced speed horses fell apart before the 1/8th pole. The temperature was frigid and the inner was a dried out sandy beach. Understatements race off the layoff wire to wire was a hidden beauty. Layoff speed horses are not supposed to keep going on a tiring track like that. This million dollar purchase is finally living up to his potential. Understatement will stalk the distance challenged Palmers Approach and likely draw off to win. The wonderful part is that he will likely not be the favorite. Bet to win and box with Icabad Crane in the exacta. Looks like the two NYRA productions that are on MSG+ have evolved. The nightly replay show formerly known at "Thoroughbred Action" is now called "Aqueduct in 30". The weekly feature segment formerly known as "Inside Racing" is now called "Thoroughbred weekly". The daily show on MSG+ is now known as "Aqueduct In 30" It is produced and hosted everyday. HRTV also shows Aqueduct replays nightly but sometimes they edit out NYRA content only showing replays. The NYRA produced content is always on MSG+. The excitement in the racing community for the show Jockeys is building. For years commentators like Jerry Bailey have advocated using the Jockeys as a marketing tool for the sport. Jerry Bailey's point was that the jockeys are the only way for non-gambling or non-horsey people to identify with the game. Jerry Bailey's point will get the test tonight. From the previews I suspect the production is well done. Some of us that are involved in the game certainly bet on this show. Even a notorious cheapskate like power cap upgraded his Dish Network package just so Animal Planet is part of the menu of channels. After Jockeys is "Untamed and Uncut" which features racetrack programming, so trackfans have two hours of programming to look forward to tonight on Animal Planet. Here is a great betting race due to the entry of Giant Moon and Icabad Crane. Two horses that will attract much betting action that have only a small chance of winning. When you have two horses who promice to take huge action this sets a up a great betting race. The pick here is Manteca who is running second off the layoff and ran huge from off the pace last out. Not only does Manteca have a great chance to win but he should be a generous price. Should be plenty of value in the Grand Slam that ends here and in exactas or trifectas with some of the other horses underneath with Manteca keyed.